Rivercane was once one of the most abundant plants in the southeast. It formed impenetrable forests growing along the region’s riverbanks. 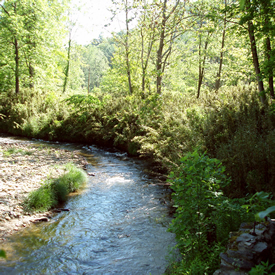 In western North Carolina, cane grows along the banks of the region’s many rivers, including the Little Tennessee, Oconaluftee, and Tuckasegee. It is the most traditional material used by the Cherokee with evidence of its use going back 500 years. In the southern Appalachians, fragments of rivercane baskets have been found that date to the 1400s and 1500s; some scholars believe that this tradition may have begun as early as 600 AD. 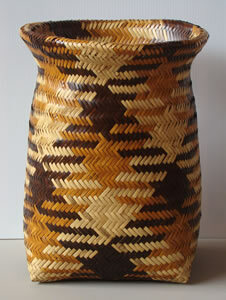 1 If there is one craft object that is emblematic of Cherokee culture, it is the rivercane basket. In the 18th century, there are several comments that record the abundance of rivercane, and a few statements that describe rivercane baskets in particular. Most of these observations are from 18th century expeditions into the southern mountains by explorers and naturalists. Botanist Mark Catesby found rivers “covered with spacious tracts of cane” when he arrived to document the local flora and fauna in 1724. In 1728, William Byrd, while blazing a property line between Virginia and Carolina, encountered “a Forest of Tall canes.” Traveling in 1791, William Bartram came across “perhaps the most extensive Canebreak that is to be seen on the face of the whole earth.” 2 With rivercane in plentiful supply, it is not surprising that inhabitants of the southern mountains—the native Cherokee—would find a use for it. Also in the 18th century, there are a few published descriptions of Cherokee baskets. In his Natural History of Carolina, Catesby commented on the quality of native basketry. “The baskets made by the more southern Indians, are exceedingly neat and strong,” he wrote, “[They are] so closely wrought they will hold water.” James Adair, author of the 1775 History of American Indians, recorded a lengthy description of a double woven basket that is most likely made of rivercane. There is at least one picture of a Cherokee basket from the 17th century. A European painting, The Treasures of America, depicts a round basket at the foot of a trio of native cherubs. 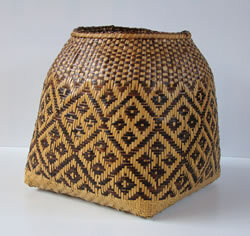 With its diagonal weave, the basket appears to be rivercane. Physical evidence of rivercane baskets supports the recorded remembrances of this period. Among the most significant is a set of rivercane baskets taken to London in 1725 by Sir Francis Richardson, the first governor of the Carolina colony. Now in the collection of the British Museum, the set is tagged with a note that claims, “They will keep anything in them from being wetted by rain.” 4 The Richardson baskets are double woven and dyed with pokeberry and walnut. The pair forms two oblong rectangles (each approximately 20” long) with one serving as the lid to the other. 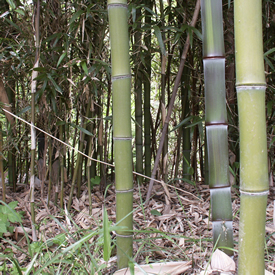 Curiously, the two parts do not share the same pattern, a trend that continues in today’s rivercane tradition. 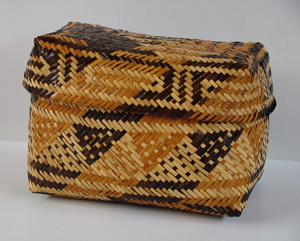 The bottom half of the basket is woven in an Arrow Point pattern; the lid is Man-in-a-Coffin. While European eyes would assume a basket and lid would have to match, the fact that they do not match may tell us more about how the maker thought the baskets should be used. These may have been intended as two baskets, fitting together as they do, but ready to be used separately. The set of baskets taken to London by Francis Richardson played a significant role in the Craft Revival when, in the late 1930s, someone sent a photograph of them to basket weaver Lottie Queen Stamper. At the time, there was only a handful of Eastern Band Cherokees who could make a double weave basket. Stamper studied the Richardson baskets to determine how to make the pattern and the weave. For two-and-a-half days she carefully worked out the design on graph paper, and then wove a smaller version of the two baskets. 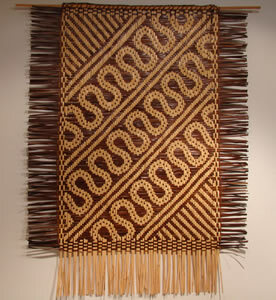 While some have credited Stamper with reintroducing the double weave into Cherokee culture, scholar Sarah Hill, in her book Weaving New Worlds, disputes that claim, citing that the double weave was known to other makers, including Nancy George Bradley and her daughter, Rowena. 5 There is no doubt, however, that through Stamper’s perseverance and many years of teaching, she popularized the form and revived its popularity. A double weave basket is a curious thing. It is really two baskets, one inside the other, woven together at the rim. Its maker begins at the base of the inside basket, working upward to the rim where the cane is bent downward; the outside is woven from top to base. Not only does this method allow for strength but, in some cases, skilled weavers have created baskets with one pattern on the inside and a different pattern on the outside of the same basket. Double woven baskets were particularly appropriate as storage containers; their dense weave allowed for security and, in some cases, were water repellant. The double weave is not the only way to weave a basket from rivercane. Single weave rivercane baskets have remained an enduring tradition. The single weave method is used to make mats, coverings for floors, walls, and seating, and large storage baskets. In 18th and 19th centuries, when homes were without closets or cupboards, baskets held everything from harvested foodstuffs to clothing. 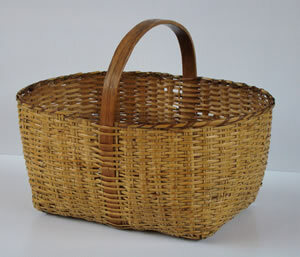 Well into the 20th century, rivercane baskets were used in Cherokee homes and in the garden for use in gathering, storing, transporting, and food preparation. Before baskets became items of trade, they were used in Native communities for ceremonial purposes. As mountain tourism became more popular and the Craft Revival provided outside markets for mountain crafts, Cherokee basket weavers responded by producing baskets for the tourist trade. While many traditional forms and patterns remained, new ones emerged; smaller and more colorful baskets were favored by tourists. For the most part, today’s Cherokee artisans are interested in honoring tradition and are revitalizing historic forms and techniques. The “revival” of such traditions was an effort that popularized and marketed regional forms to a nation hungry for a culture of its own. Today’s tradition of rivercane basketry is flourishing due in large part to the efforts of teachers like Lottie Stamper and organizations like Qualla Arts and Crafts Mutual. Still, its future rests on three interwoven factors, each a necessity for the tradition to continue. These key elements in the sustainability of rivercane basketry include the natural resource habitat, the transference of traditional knowledge, and a market supported by an appreciative public. 1. Susan C. Power, Art of the Cherokee (Athens: University of Georgia Press, 2007) 29. Titled Les Tresors de l’Amerique (Treasures of America), the painting reproduced in Power is by Gregor Brandmuller in the Musee du Nouveau Monde, France, 29. Power dates rivercane baskets to the Woodland period 600-900 AD. She notes surviving examples of rivercane weaving: a double-weave fragment dated 1500 AD from Rhea County, Tennessee; a single-weave fragment dated 1450 AD found in Monroe County, Tennessee, 29. 2. Sarah H. Hill, Weaving New Worlds: Southeastern Cherokee Women and their Basketry (Chapel Hill: University of NC Press, 1997) 39. 3. Hill, 55-58. Rodney Leftwich, Arts and Crafts of the Cherokee (Cherokee: Cherokee Publications, 1970) 9. 4. Susan C. Power, Art of the Cherokee (Athens: Univ of Georgia Press, 2007) 29; Hill, Weaving New Worlds, 58. 5. Hill, Weaving New Worlds, 299-300. 6. Mooney is quoted in Hill, 176.